Super fluffy, buttery and fresh out of the oven. For that, thankfully I have my go-to Best Damn Vegan Biscuit. But a girl has to have more than one biscuit recipe in her arsenal if you ask me, so I went back to the drawing board. I’ve been on a bit of a nutrition yeast kick lately and have been putting it on everything, especially pizza and pasta. And if you’ve been reading Minimalist Baker for a while now, you know I adore spicy food. So it was natural to want to try my take on a cheddar jalapeño biscuit. I’m happy to report that the result was a massive success. These little golden gems are the real deal! It starts with your basic dry ingredients plus nutritional yeast! That’s what gives it that amazing yellow color and cheesy flavor. The rest is simple: Mix your dry ingredients while your vegan buttermilk activates, then cut in your vegan butter or coconut oil. Next, stir in your jalapeños and add your buttermilk and stir. Form into a disc, cut and butter! That’s it – the whole process takes about 10-15 minutes. And the result is so worth it: A beautiful, buttery, tender biscuit just asking to be devoured. I mean, come on…look at these guys. Make these for a special weekend brunch or slow breakfast or alongside your favorite soups or summer grilled items. I can’t wait to make these for some unsuspecting cheese-loving friends. I think they’ll be totally oblivious to the fact that these are completely dairy-free. Cheers! Simple, 1-bowl vegan cheddar jalapeño biscuits. Fluffy, soft, buttery, and so “cheesy,” with the perfect hint of spice. Add lemon or vinegar to almond milk to activate/curdle. Add cold butter and use fingers or a pastry cutter to combine the two until only small pieces remain and it looks like sand. Work quickly so the butter doesn’t get too warm. Then add jalapeños and toss. Use a 1-inch thick dough cutter or a similar-shape object with sharp edges (such as a cocktail shaker or drinking glass) and push straight down through the dough, then slightly twist. Repeat and place biscuits on a baking sheet in two rows, making sure they just touch – this will help them rise uniformly. 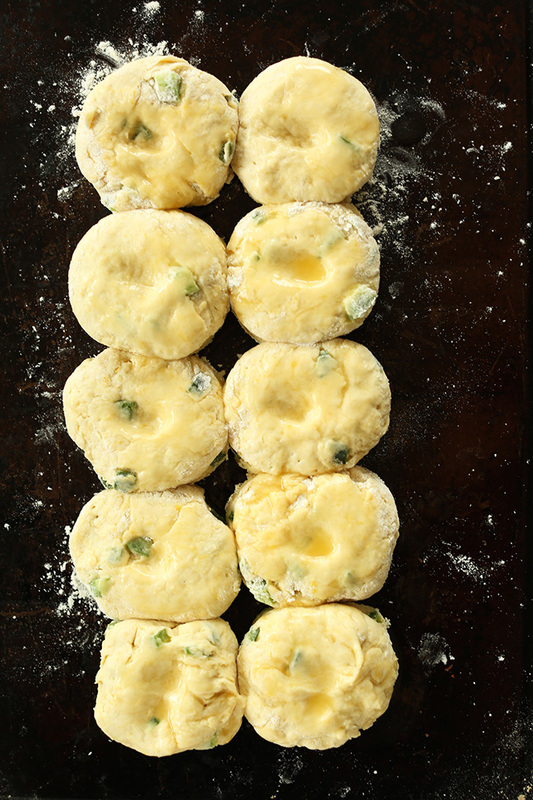 Gently reform the dough and cut out one or two more biscuits or until all of the dough is used– you should have 8-10 (as original recipe is written), depending on the size of your cutter. Bake for 10-15 minutes or until fluffy and slightly golden brown. Serve immediately. Let remaining biscuits cool completely before storing them in an airtight container or bag. Will keep for a couple of days at room temperature. Hi! Do you think I could refrigerate the dough just before baking? I’m thinking of making them this weekend and bringing the pan with the dough to a friend’s house to bake there so they are ready to serve while hot. Wondering if they would still turn out if I did that — any ideas? Love these!! I’ve made them a couple of times and they’re so easy and delicious! I make these all the time! They’re always soooo good. I haven’t tried with coconut oil, only the vegan butter. We’re so glad you enjoyed this recipe, Sofia! Have you tried making these using gluten free flour? Scrolled down to see there were a couple people who asked but didn’t see an answer. Thanks! Love this recipe! worked out amazingly. Will definitely making these again. Wow! I didn’t have jalapeno so I used an equivalent amount of green onion, buy otherwise followed the recipe. These are sooooo tasty. I think I may add a little bit more nutritional yeast next time and make sure I actually have jalapeno on hand. These were the perfect addition to Sunday night dinner. I had everything on hand. I used coconut oil in place of butter and they turned out well. Thanks for the great recipe! Has anyone tried to make these with whole wheat flour? Whole wheat pastry flour would likely be best, trying to reconcile my desire to please the masses at a work potluck with my personal avoidance of white flours. sooo good. followed exactly except i left out the jalapenos. still cheesy and delicious! does everyone just microwave the leftovers when they want another biscuit? The first batch I made I lined up on the baking sheet almost ready to go in the oven when I realized I forgot to add the salt. I went online to see if that would be an issue. I learned that salt is an impartant component to baking breads. So, my question is I only have salted butter (earth balance) should I use less salt or the amount the recipe calls for? I just wanted to follow up, I made the ones without salt and salted butter and they acutally came out really good! I did make a second batch with coconut oil and salt, still good! I have baked and cooked countless of your recipes and I just have to say you never cease to amaze or disappoint me. Keep up the yummy work! 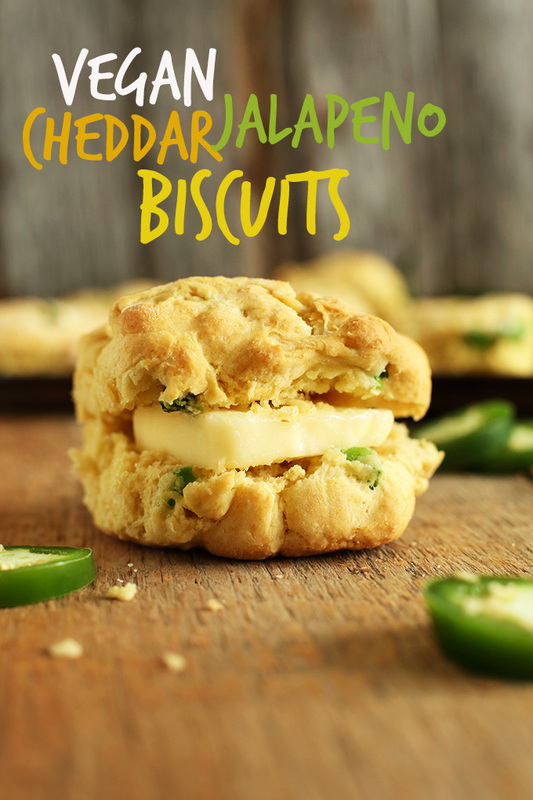 I’m not usually a fan of jalapenos in biscuits but I tried these and they’re delicious!! I have tried to make this gluten free and whilst you get more of a thin biscuit than what you have discribed it is still a great recipe! Any ideas on how to make them more fluffy with gluten free flour? Thanks Dana for the amazing recipe! I made these last night and they turned out GREAT! The almond milk I had in the fridge was vanilla so I used canned coconut milk instead. I also added one teaspoon of granulated garlic powder and I have Celiac so I used a gluten free flour mix. I’m not a huge baker, but the step by step directions were perfect and I used a measuring cup to cut out my muffins. I baked them for 23 minutes and then served them warm with melted Earth Balance with a sprinkle of garlic powder. Super easy and super YUM! I will definitely make these again. Bonus points that they pair perfectly with red wine. Cheers! I am mildly or should I say wildly obsessed with these! I make them at least 2 times a week. I plan meals around them!!! Made these! Quick, easy and delicious. I used coconut milk, coconut oil and added an extra tbsp of nutritional yeast. They turned out perfectly ! Thanks for the recipe. Made these last night and they were fantastic. I did make a few small changes- I used garbanzo bean flour and added some chopped spinach. Thanks for the recipe! These turned out great! My extremely-carnivorous family all mentioned that they loved the strong cheese flavor (They have no idea ;) ). It was my first time making biscuits. Is the dough always this sticky?! Perhaps I did something wrong. Will definitely make again someday! The dough will be sticky, yes. But if “too” sticky, add a bit more flour! Just made these for Friendsgiving! They are INCREDIBLE. so fluffy on the inside and crispy on the outside. How many biscuits does this recipe yield? And can I omit the jalapeños without altering any of the other ingredients? You can leave out the jalapenos. It makes about 6-8 biscuits, depending on the size of your biscuit cutter. i don’t have any jalapenos on hands…but i have veggies (mushrooms and garlic!) i’m going to make this recipe right now in a double batch for my lunch! i’m hungry. I’m glad i found this recipe, because those biscuit are amazing! I posted them on instagram <3 Instead of all purpose flour i used whole wheat flour, added some spices (only garlic salt and italian mix) and 1tps of salt. I used coconut oil (challenge myself to do it because i don't use it that much in the kitchen) and my mushrooms and garlic. I forgot to butter them when i put them in the oven but it wasn't a big deal since they smell and taste like heaven. Though, next summer, i'm going to do it again in summer (jalapenos don't usely grow at this time of year :/) and enjoy it like never. HAHA i forgot to mention i made my biscuit 2 inch wide! i never expected them to be that big! XD i don’t have any cookie cutter so i found a mason jar lid and though it would be fine. wow. I laughed so much, this is ridiculous. Delicious! I used ACV instead of lemon juice and added some Daiya, just to get rid of it. I will be making these again. I’m going to try these with a gluten free flour….always a bit of a challenge but either way, i’m sure the results will be wonderful! Thanks for the recipe, I’m excited! These are SO amazing! I mentioned in another comment that I make your biscuits pretty often (usually on weekends for biscuits and gravy) but this weekend I saw this recipe and couldn’t resist. I am making them again tonight! No such thing as too many comments! Thanks for sharing, Sadie! Excellent! Goes great with salad. These turned out so well! I got 8 good sized biscuits out of the recipe. I might add a touch more nutritional yeast next time, but other than that, delish! These sound excellent, can soymilk be used instead of almond, or will the result not be the same ? It’s also the lowest price around when you order the 5 lbs, coming to just over 8 dollars per pound, and that includes the shipping charge ! Can I use another type of milk? I have nut allergies and don’t use cows milk either. Can you recommend another type of milk to use? Thanks in advance. Hey Dana! This recipe looks delicious! I’m looking to make these GF… any suggestions on how to change the flour/liquid ratio? Just made these to eat with black bean chili. Yum deluxe. These turned out GREAT. I used regular butter rather than non-dairy butter, everything else, as is. And they were absolutely awesome. I also used a pretty small tool to cut and had about 14 mini biscuits. Yum :) Thanks for the recipe! Think I can use a habanero pepper, seeds removed? I got one in my veggie basket this week. I know they are hotter, but not sure if it would be too much heat for this recipe. They’re definitely hotter, but if you’re up for it I think they’d work beautifully! Just scale back a little to avoid too much heat. I was wondering what brand of nutritional yeast you use? I have never tried it and it sounds like an amazing thing to have on hand. Your blog is amazing I just came across it because someone on Instagram. Thanks Stefanie! I actually get it from the bulk bin at my health food store, so I’m not sure what brand it is. But I’ve heard Bragg’s is quite good. Hope that helps! I haven’t tried these biscuits GF in any capacity, so I’m not sure how much advice I can give. But you can scan the notes on my original Best Damn Vegan Biscuit post where I believe some people made them GF with success. Hope that helps! All your recipes are A+++! A quick Q though, is it ok to sub the vegan butter/coconut oil for another oil, like canola for instance? I made these and they were delicious. Check out my pictures on Twitter. I plan to try the brownies next. I’ve never tried nutritional yeast, even though I hear about it all the time, but these look so good I’m going to have to change that! haha, excitement welcomed! Thanks for sharing, Ceara. These look delicious and have been meaning to let you know all day good job on this recipe. Holy cow! You are making my dairy-free self so happy with your cheese-its, nacho dip, and now this!!! I almost can’t even bear it! Thanks for posting! Do u think these would work with a gfree flour? & I love substituting nutritional yeast out for cheese! I’d like to know the same thing, I am trying to go gluten free and haven’t mastered the flour subbing thing yet. 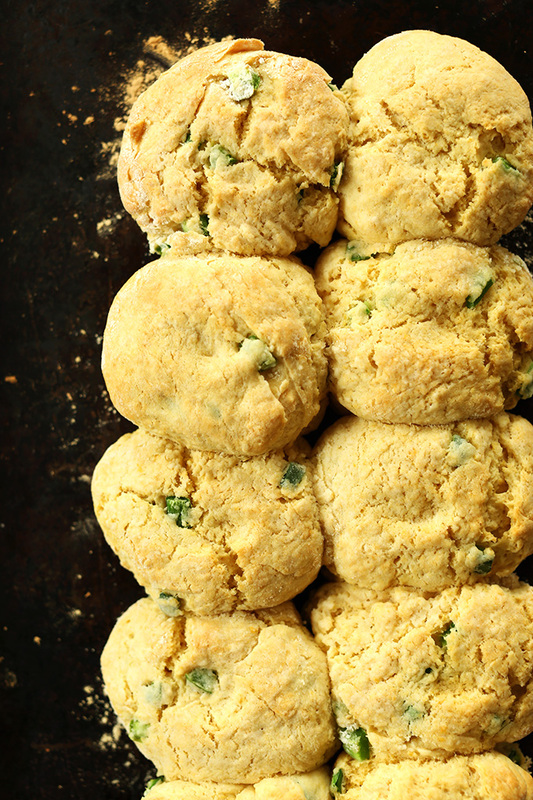 The fact that you’ve managed to make a cheesy biscuit without any cheese is really awesome! I was about to skim through the recipe and point out the lack of cheese subs, but it’s a good thing I read through the post first ;) thank you for sharing! yummy!! that looks sooo good!! I love a spicy biscuit and these look delicious! Oh, keep looking! You can find it at most health food stores or the health section of traditional grocery stores. If you can’t find it there, just order it online. Hope that helps! Thanks, Lena! I am going to have to get my hands on some of that nutritional yeast, I can see that it really adds a really nice flavor to foods. Great looking biscuits. Gee thanks! I’ve been struck by celebrity on Minimalist Baker. Can we be Midwest blogging buds? Please, please please? Every single thing you post looks absolutely delicious! I love your blog! :) Pinning these biscuits to make them later. 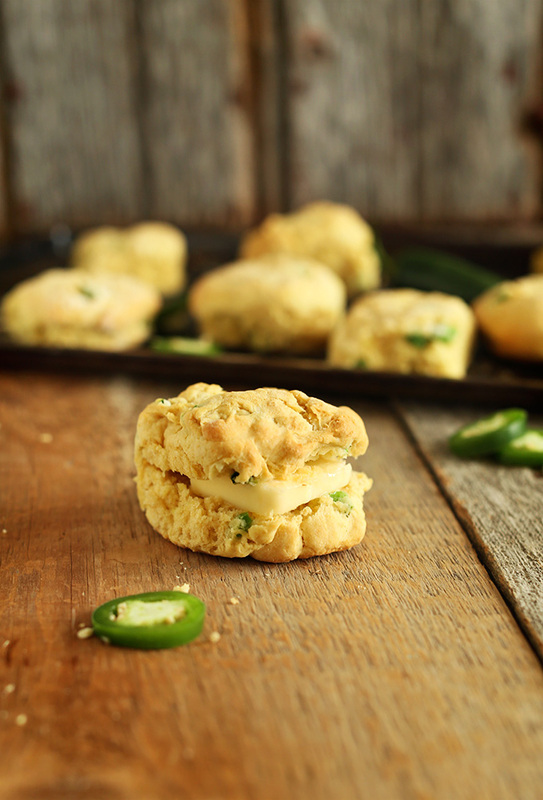 If you guy loves jalapenos, cheese and carbs, these are the biscuits for him! I just recently bought nutritional yeast and haven’t explored much with it yet, so I’ll definitely have to make these! I’m excited to try them out. 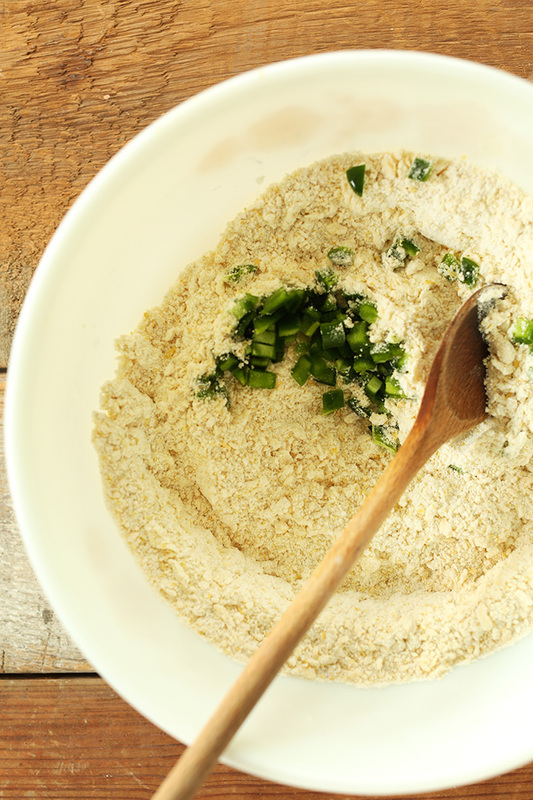 What a great first recipe to try with your nutritional yeast! let me know how it goes, Jenna! Sounds like a flavour packed combo! I swear nutritional yeast is a wonder food! Ooh, I love this recipe! I think cheddar and jalapeno pair so wonderfully together. 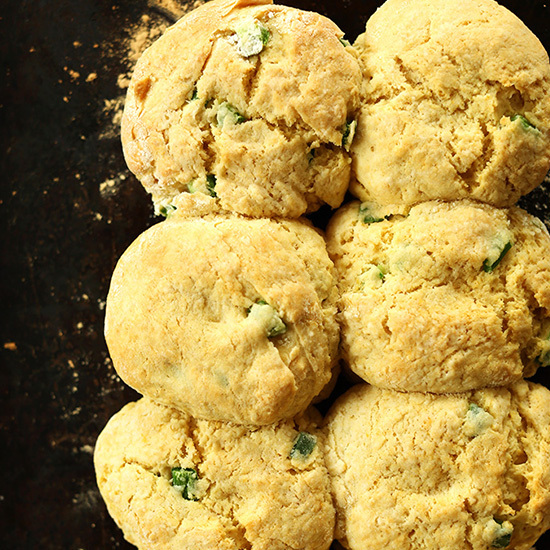 The salty richness + heat just folds into a biscuit so perfectly! 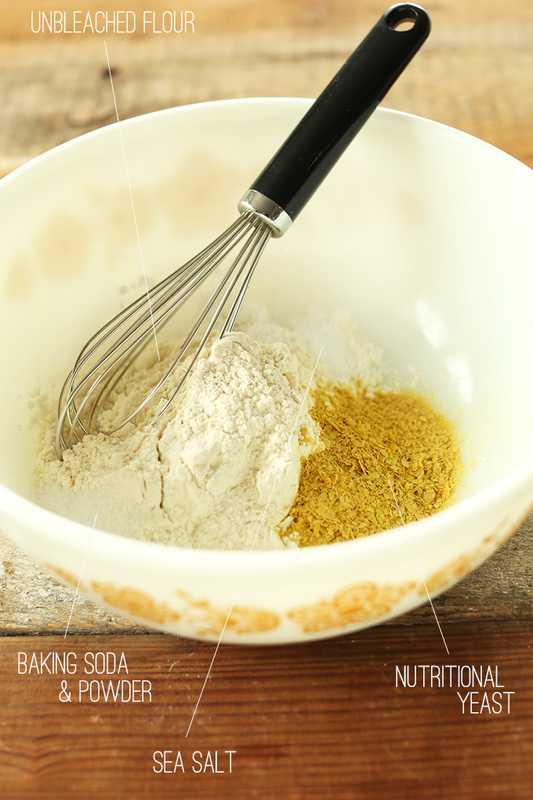 I love how you did this with nutritional yeast – can’t wait to try! Pinned. oh oh oh, this si great combo!!!! I have to try them today! Thanks! No, nutritional yeast is a vegan-friendly product that looks like little gold flakes, which also provides the “cheesy” taste in dishes. I love a good biscuit and it looks like you nailed this. I’m all about the spice, too, so I’d love this recipe. As always, stunning images and great idea and always impressive you can keep cheesey stuff vegan! Nooch is my BFF for stuff like this, too! Thanks Averie! So kind. Thanks for the share!